LOCATION: The Hubbard-Armstrong-Bauman House is located at 509 Washington Avenue on the N/2 of Lot 12, Block 34 (Culmseig Map of 1854). BUILDING: The Hubbard-Armstrong-Bauman House is a one-story, side gabled roofed, wood frame, raised cottage. The full-width undercut five-bay gallery is supported by colonettes. The three central bays of the five-bay facade consist of transomed doors. The outer bays are six-over-six double hung windows. There have been some additions to the rear and north elevations. It is estimated that the house was constructed in the middle 1850s making it one of the oldest extant homes at Ocean Springs. A study of the Hubbard-Armstrong-Bauman House site utilizing Sanborn maps indicates several stages of development between 1893 and 1909. During this time, several alterations and additions occurred. The area of the house increased from 1375 square-feet in 1893 to just over 2000 square-feet by 1909. There has been virtually no change in the area of the house since 1909. With the absence of Jackson County land records and tax rolls prior to 1875 due to several conflagrations occurring at that Courthouse, it is difficult to determine the exact age of the Hubbard-Armstrong-Bauman House. A manuscript in the files of the St. Alphonsus Catholic Church relating the early history of that Church tells of a faithful Catholic woman, Sophia Schnider Hubbard (1822-1900), who offered her Washington Avenue home for the celebration of Mass prior to the construction of a Catholic Church at Ocean Springs. Mrs. Hubbard, a native of Bavaria in southern Germany, was the wife of George Hubbard (b. 1820), a retired businessman born at Connecticut. The Hubbards were probably former residents of New Orleans. Bishop Elder reported also in 1859 that, "Father Georget has bought the lumber for the church at Ocean Springs. It is to measure 50 feet by 25 feet very plain". Father Georget was the pastor at Biloxi, and he took on Ocean Springs as a mission. Helen Thomas Armstrong (1858-1928) was the wife of John L. Armstrong (1851-1911). She was born at Jasper County, Mississippi, and came to Ocean Springs in 1871 with her parents, Barney Thomas (1807-1878) and Roxy Ann Best (1816). The Thomas Family had migrated to Mississippi from Anson County, North Carolina. John Armstrong was also born at Mississippi of Virginia parents. He toiled as a farm laborer, but later went to work for the L&N Railroad. Armstrong pioneered the rail route between New Orleans and Mobile participating in this construction. Later in his railroad career, he served as a bridge gang foreman and water pumper. Armstrong had two brothers, L.W. Armstrong and George Armstrong. The Armstrongs had one son, Don Carl Armstrong (1880-1911), who was a carpenter. He became very ill at Colorado Springs, Colorado in 1911. His mother went West to care for him, but he never recovered from his malady. Both cottages were destroyed in the Big Fire of November 1916 with the J.P. VanCleave Store, Richardson Cottage, Ocean Springs Fire Company No. 1, and the Vahle House. George W. Thomas (1854-1932) was a native of Jasper County, Mississippi. He resided most of his life at Ocean Springs were he farmed, worked for the L&N Railroad, and in later life was considered an expert gardener. Thomas is credited with planting the oak trees on Washington Avenue. Thomas had two families. With his first wife, Laura Sutton (1853-1887), an Alabama native, Thomas fathered: Julie Annie Thomas (1877), Charles L. Thomas (1878), James Acey Thomas (1882-1919), and Edith Armstrong (1886-1967). After Laura died , George Thomas married Evelyn Woodcock (1867-1904) of Ocean Springs. They were married in 1889 and had the following children: Mary Jane (Mollie) Penton (1890-1978), Georgia LeBatard (1893-1976), Jessie William (1894-1906), Harold (b. 1896), Aline King (b. 1899), and Lee J. (1902-1958). Another child died in infancy. Jessie William Thomas (1894-1906), called Willie, had a fatal accident in Ocean Springs on October 5, 1906. Willie was crossing a stile when he fell and a splinter perforated his wind pipe. Marby A. Penton's father, had come to Moss Point, Mississippi to build boats for the Dantzlers. He moved the family to Biloxi and died of yellow fever circa 1888. As a young man Marby Penton worked on a charcoal schooner. He later joined the L&N Railroad as a carpenter at its Gautier, Mississippi creosote plant about 1910. The Pentons reared a large family on De LaPointe Road at Gautier. The Penton children were: Houston (1909-1973), George A. (1911), William Kell (1913-1993), Joseph W. (1916-1970), Gordon J. (1920-1981), Marby R. (1922-1995), Floyd E. (1925), and Claude H. (1929). One son, Marby R. Penton (1922), lived at 206 Washington Avenue in Ocean Springs. He served the community as their three term representative to the Mississippi State Legislature in the late 1960s and early 1970s. Penton was d'Iberville in the 1979 reenactment of the 1699 Landing. During their ownership, the Pentons never lived in their Washington Avenue home. It was utilized as a rental house most probably to railroad families who were numerous in Ocean Springs at this time. 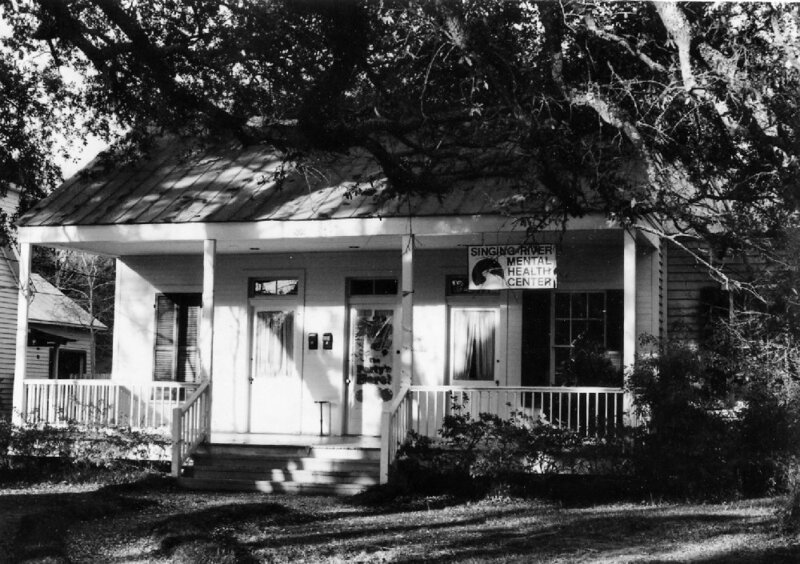 As a young woman, Mary Jane Ake worked as a housekeeper for Dr. Henry B. Powell (1867-1949) at the Bayou Inn. At the Powell inn, she learned the skills essential to managing a public house. While married to Henry King, Mary Jane operated a rooming house at the King home located to the rear of the Westbrook Barber Shop on Washington Avenue. Here the Kings reared two daughters, Emma Mae King Bauman (1906-1988) and Rosalie King Shock (1908). After moving to the Ake home on Washington Avenue, Mary Jane opened the house to roomers. She let rooms to single men for $2.50 per night. Although married to John Ake, she was called "Mrs. King" by the towns people. After Mrs. Ake's demise in January 1962, her daughter, Emma Mae Bauman, took over the Washington Avenue rooming business. Room rents at this time were about $5.00 per day. Single men were the primary occupants. Emma Mae had married Manuel Bauman (1904-1973), a Russian immigrant, born at Maloyaroslavets, USSR, site of the 1812 battle where the Russians prevented Napoleon from retreating southward. He entered the United States at Philadelphia with his father in 1910. The Baumans settled at Lamoure, South Dakota. Manuel, called Monk, and a friend, Edward Shock, came from the Midwest to Ocean Springs in the late 1920s to work on the seawall. They met and married the King sisters, Emma Mae and Rosalie. Monk and Emma Mae Bauman had three daughters: Mary Louise (1930), Treva Eglin (1934), and Sheila Puffer (1944). At Ocean Springs, Bauman made his livelihood as a plasterer and cement finisher. The Shocks moved to Lincoln, Arkansas. Carroll B. Ishee was born at Hattiesburg, Mississippi and became a lawyer after serving in the US Army. He received the Silver Star for bravery while serving with the 82nd Airborne Division in Europe. After WWII, Ishee practiced law briefly at Biloxi, but soon became bored. He developed an interest in real estate and architecture. Carroll Ishee built his first home in Gulf Hills in 1953. In time, he developed an architectural signature which is characterized primarily by its site, i.e. thick vegetation or wooded slope of a wetland. In this natural environment, he built houses featuring trees penetrating the deck, cores of trees utilized as vertical or horizontal supports, skylights, free-form bathtubs, and built in furniture. There are approximately 150 Ishee homes from Bay St. Louis to Pascagoula. In February 1969, Ishee acquired 4.3 acres from E.M. Galloway in the Fort Point area of Ocean Springs. He called the development Lover's lane Addition. Here on the northeast slope of historic Lovers Lane traced by ancient oaks and magnolias as it winds it way through grounds once inhabited by Bienville and his French colonials, Ishee created ten wonderful contemporary structures. Each home comes from the individual palette of this consummate artist who painted with foliage, wood, slate, cedar shingles, and glass to camouflage his creation in this sylvan environment. Carroll Ishee was married to Gladys Smith. They lived at Biloxi and Ocean Springs where they reared six children: Carroll B. Ishee Jr., Andre, Thomas Ishee, Jane I. Trochessett Beavers, Nell Ishee, and Rae Ishee. Mr. Ishee utilized 509 Washington Avenue as a staging area and storage for his contracting and construction enterprises. John R. Blossman (1943-2010) is a graduate of Yale University (1965) and the Vanderbilt School of Law (1968). He was elected President of Blossman Inc., a regional marketer of propane gas, in 1969. Courtney Cook Blossman (b. 1941) is a native of Greenville, Mississippi. She is a 1963 graduate of MSCW with a Bachelor of Fine Arts degree. The Blossmans were an integral part of the Friends of Walter Anderson, that organization responsible for the construction of the Walter Anderson Museum at Ocean Springs (1991). In 1979, Mrs. Blossman refurbished the old house which she utilizes as a rental. Particular attention was paid to the front gallery which had been boxed in and screened in the past. She consulted with historian, C.E. Schmidt (1904-1988) concerning the front porch ballusters. The Singing River Mental Health Clinic occupied the structure for about thirteen years. In 1994, the old rooming house is now the domicile of Letitia Galbraith, director of the Walter Anderson Musueum. The rear apartment is also tenant occupied. The Hubbard-Armstrong-Bauman House is significant not only for its historical architectural value, but as being the last operating tourist home or rooming house at Ocean Springs. It ceased this service in the late 1960s when owned by Emmy Mae Bauman. The citizens of Ocean Springs are fortunate that this treasure has been preserved through the years. The History of Jackson County, Mississippi, "George Thomas Washington", (Jackson County Genealogical Society: Pascagoula-1989), p. 367. Websters New Geographical Dictionary, (Meriam-Webster: Springfield, Massachusetts-1984), p. 718. Mississippi Coast History and Genealogical Society, "A Short History of Saint Alphonsus Parish, Ocean Springs", Volume 9, No. 4, November 1973, p. 131. The Biloxi Herald, "Sophia Schnider Hubbard Obit", January 13, 1900, p. 8. The Jackson County Times, "Mrs. Helen Armstrong Obit", May 5, 1928, p. 3. The Mississippi Press, "Penton May Run for Judge's Post", August 19, 1974, p. 1. The Ocean Springs News, "Death of John L. Armstrong", March 11, 1911, p. 5. The Ocean Springs Record, "John Blossman Heads Group Enterprises", June 19, 1969, p. 1. The Ocean Springs Record, "Penton Seeks Re-Election", June 29, 1967, p. 3. The Ocean Springs Record, "Noted home designer dies", January 21, 1982, p. 1. The Ocean Springs Record,"J.R. Blossman is Yale Graduate", June 9, 1966, p. 1. The Pascagoula Democrat-Star, "Ocean Springs Locals", October 5, 1906. Sanborn Map Company (New York), "Ocean Springs, Mississippi", (1893)-Sheet 2, (1904)-Sheet 2, (1909)-Sheet 3, and (1925)-Sheet 3.